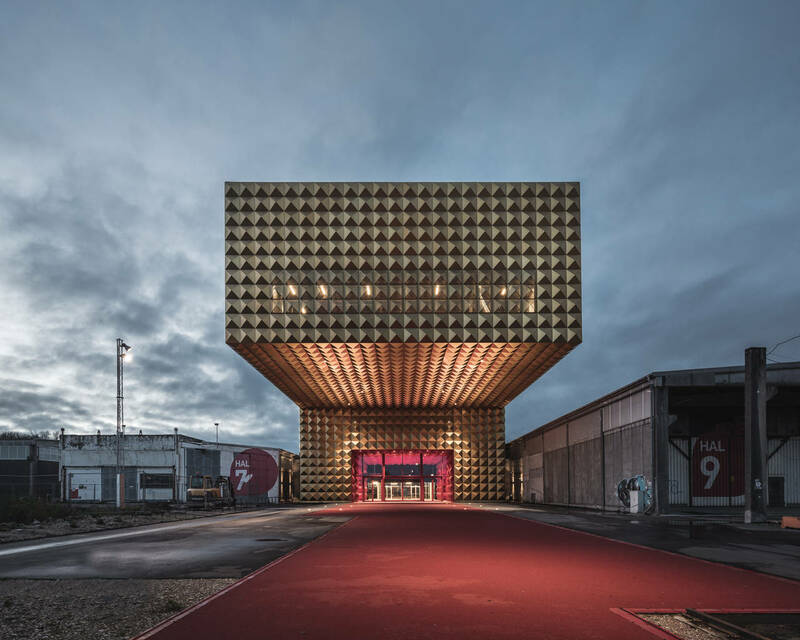 A new spectacular museum for rock, pop and youth culture, designed by Danish architects COBE and Dutch architects MVRDV, has been recently inaugurated in Roskilde, Denmark. 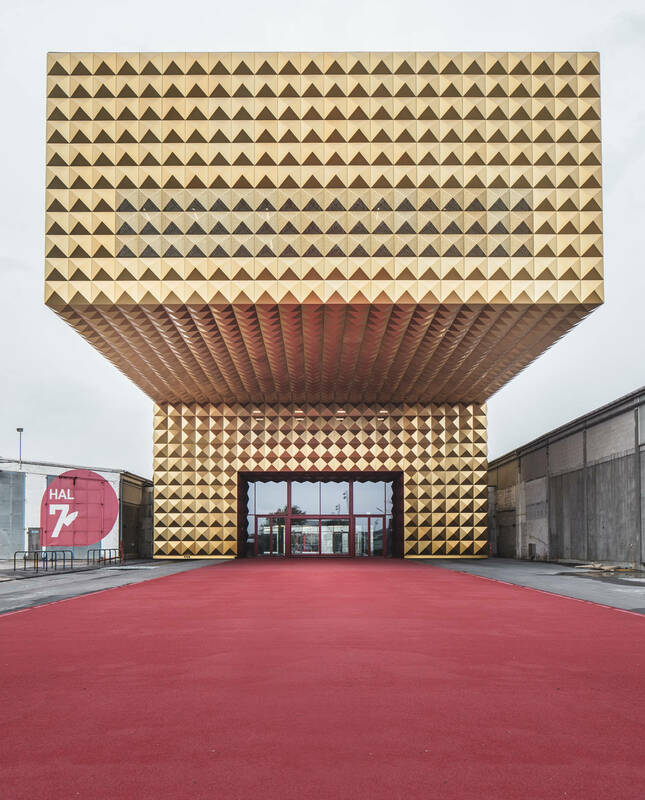 The museum is clad in dramatic golden studs and sits among old warehouses that previously housed a concrete factory in Roskilde, just outside of Copenhagen. 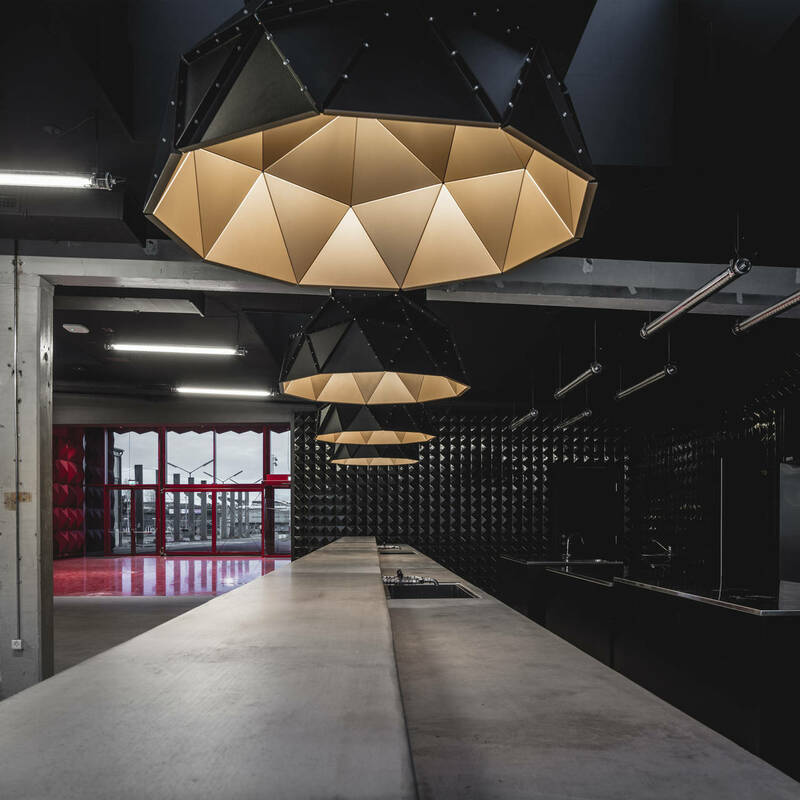 The project transforms the area into a district of rock music and youth culture, whilst adding a new building on top of the existing structures - the Ragnarock museum - housing exhibition facilities, auditorium, offices and a bar. 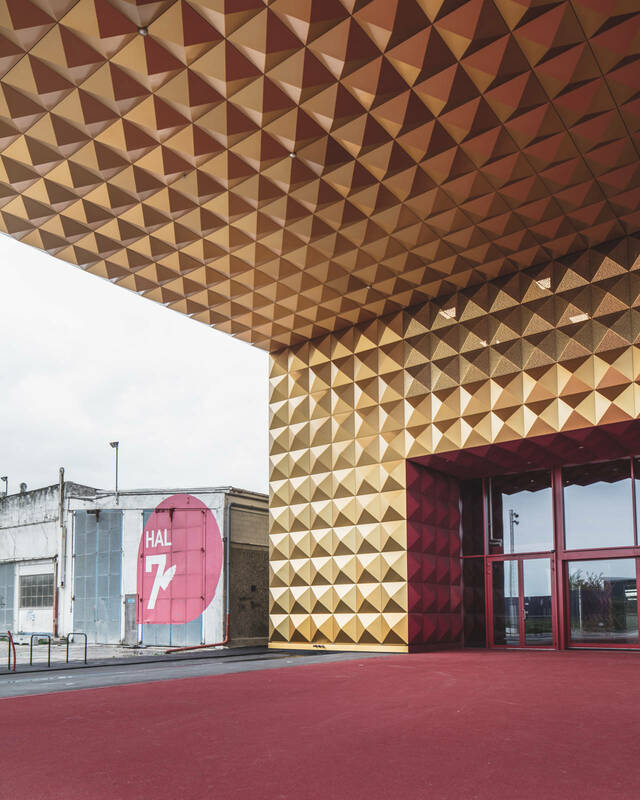 With a gold studded facade, velvety red interior and cantilevered auditorium, the building creates an exciting play between old and new, rough and shiny, simple and bold, embodying the essence of rock music. 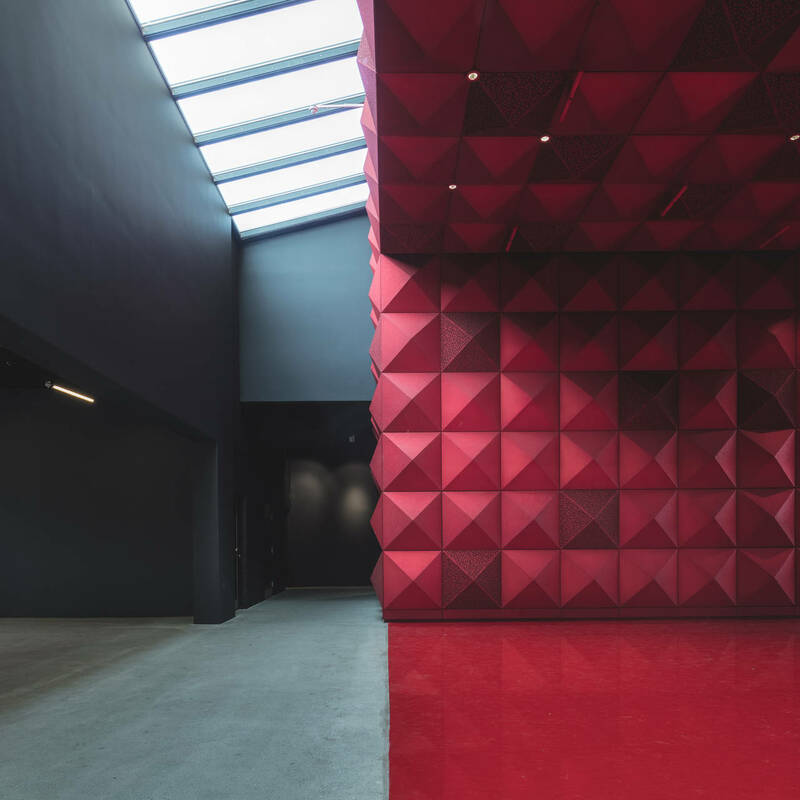 ”Our aim with the design was to translate the special energy, image and attitude of rock and pop music into architecture. 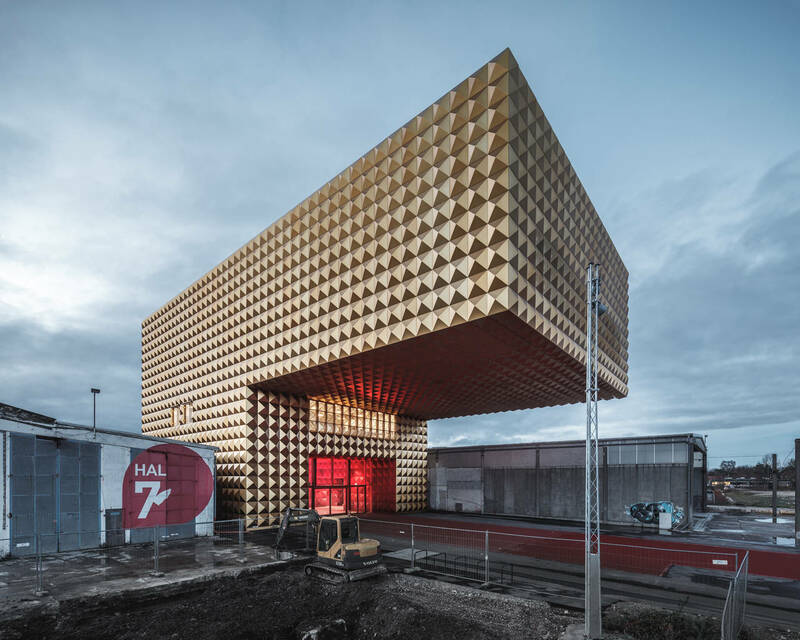 The unique building will introduce the audience to the world of rock music in a tangible way. 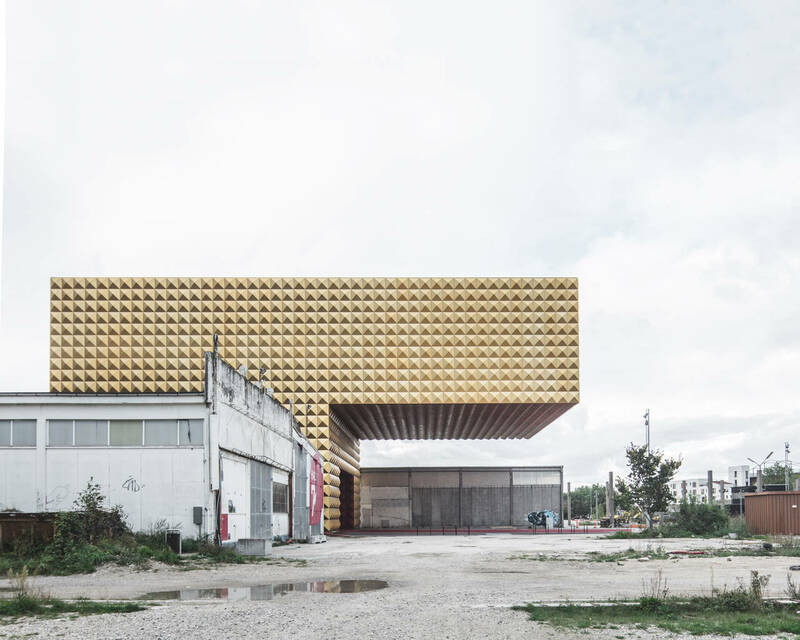 The 20 meter cantilever guarantees to have an physical impact on anybody standing under it or in it - hovering over the ground in the exhibition. It is an homage to rock and pop stars like Bowie, Hendricks and Jagger,” says Dan Stubbergaard, Founder and Creative Director of COBE. 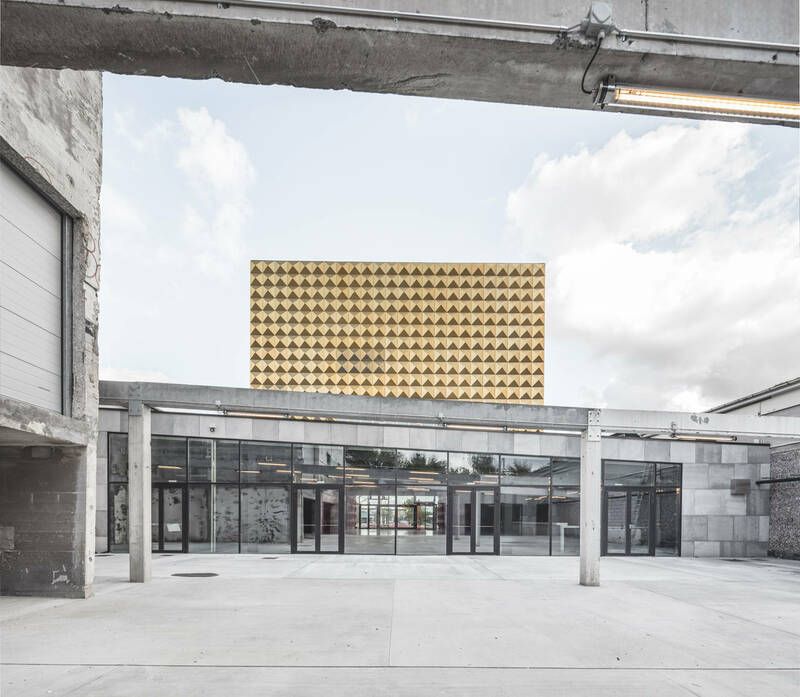 Ragnarock is part of ROCKmagneten, a masterplan that COBE and MVRDV won in 2011, which is situated in an area of Roskilde, Denmark, where a concrete factory used to be. 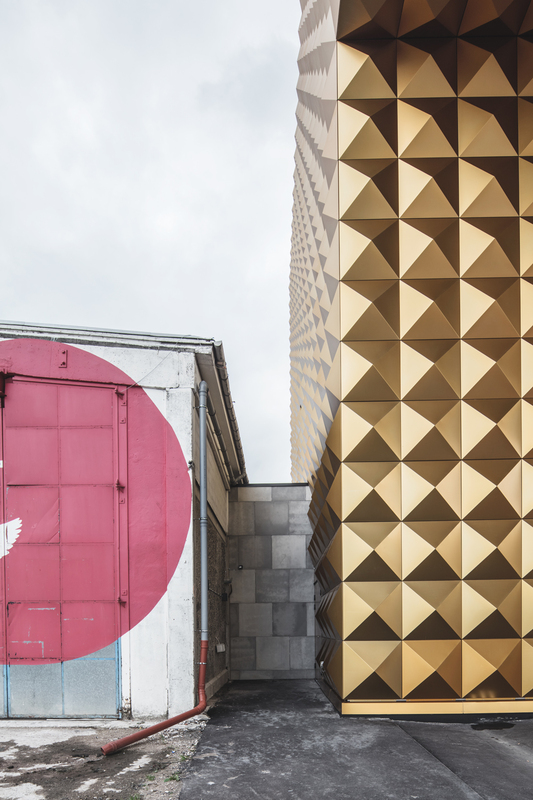 Today, the area has been transformed into a creative and cultural neighborhood. 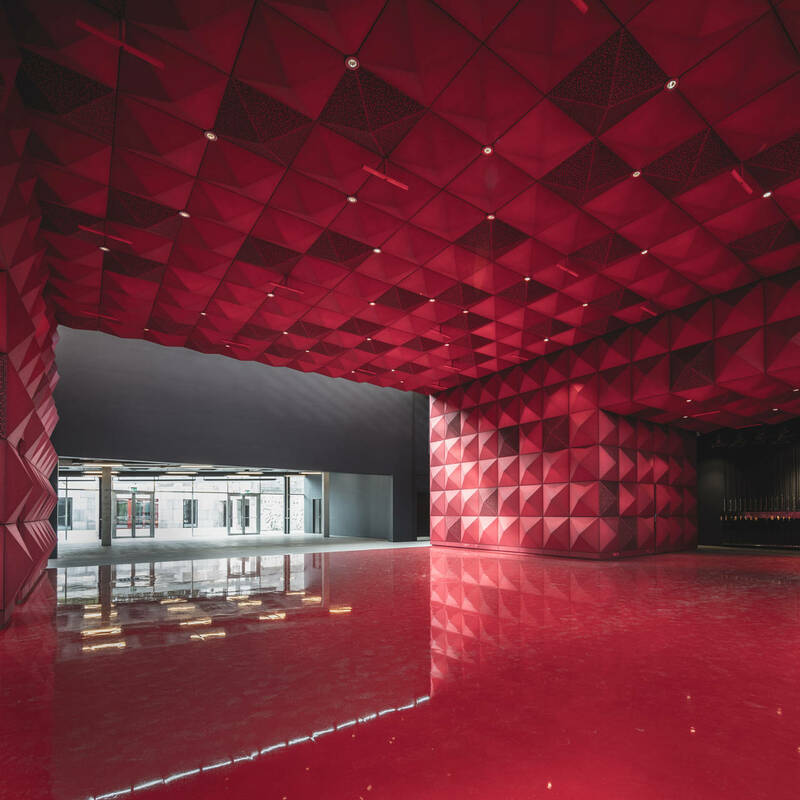 COBE and MVRDV’s idea behind the museum has been to recreate contrast between the two distinct sides of rock music. 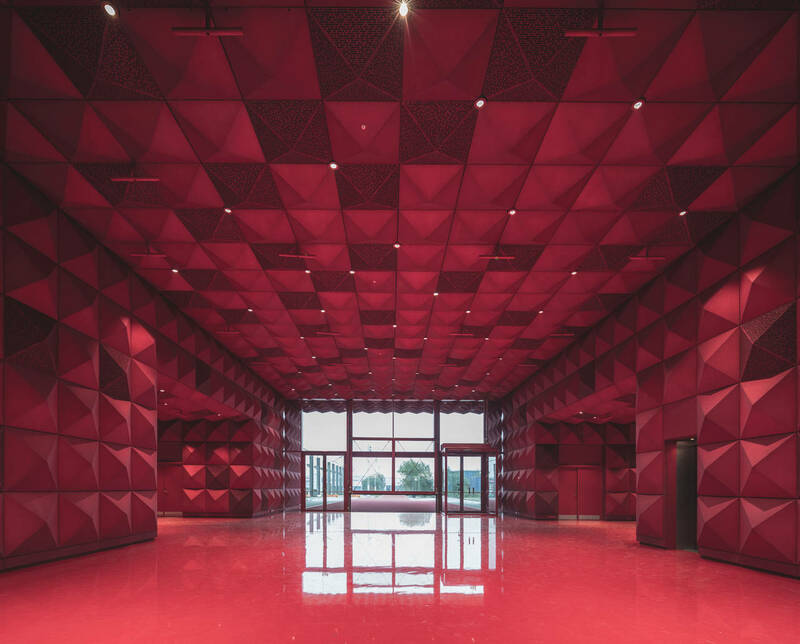 The interplay between rough and trashy on one hand, but glitzy and spectacular on the other characterizes rock music, and has provided inspiration to the design. 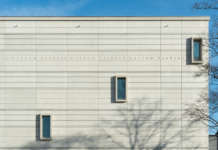 The museum spans 4 storeys and has a 20 meter cantilever. 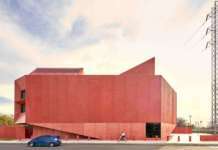 The building contains a number of public functions such as a large exhibition hall, auditorium, library, recording studios, museum shop, café, workshops, patio and an outdoor music venue. Ragnarock will become an attraction for tourists and Copenhageners alike.